Valentines seems like it’s just around the corner. Now is the time to begin thinking about what to get/make your sweetheart. 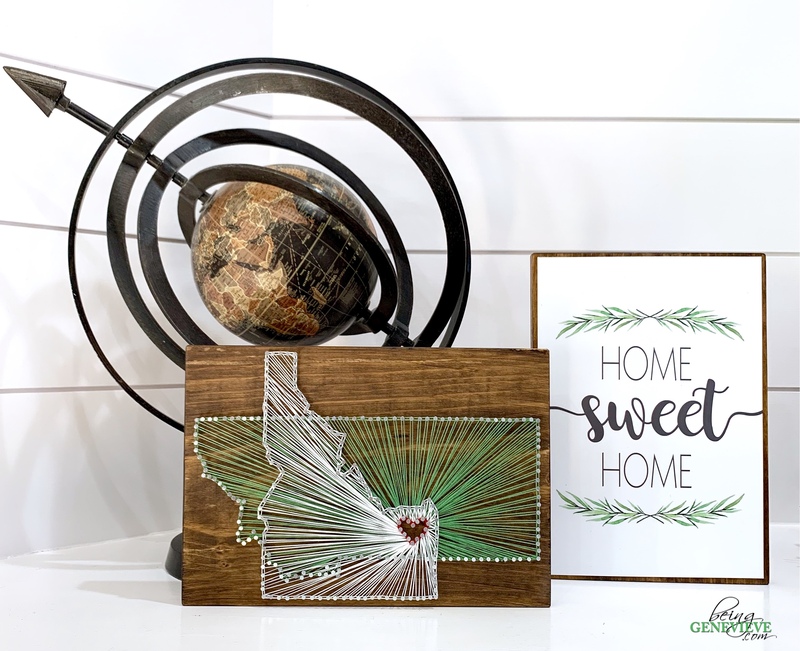 My two state string art is perfect for a valentines gift, wedding gift, Christmas gift, etc. 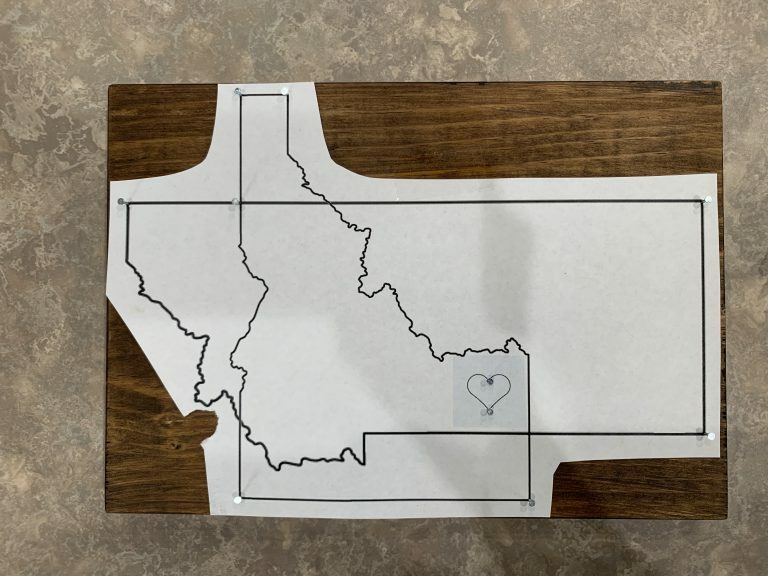 for a couple who both come from different states.The heart is located over the mutual cities. OR I recently made this for as a Christmas gift for my brother-in-law and sister-in-law. They both grew up in the same area of Idaho and currently live in Montana. 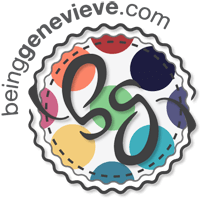 So I used their childhood hometown and their current hometown for the heart location. I bought a 1″ x 12″ board and cut it 7″ in length and then lightly sanding the rough edges of the board. Followed with two coats of Early American stain. 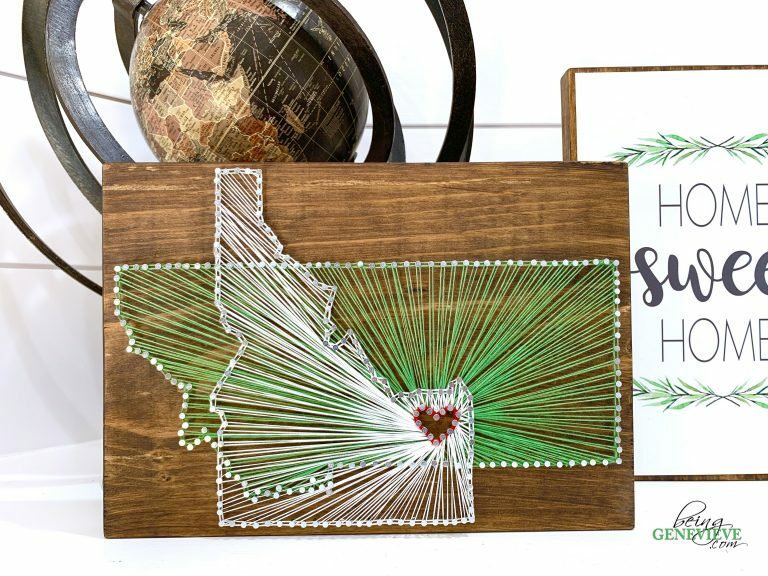 Now print off the two state with a heart over the two cities you want to highlight. 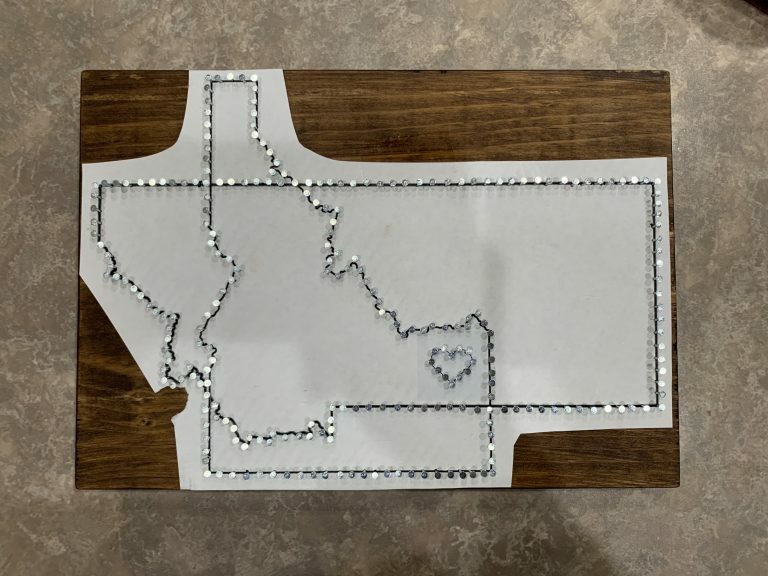 Tape the template to the board and hammer nails into all the intersecting locations of the states to help hold the template in place. 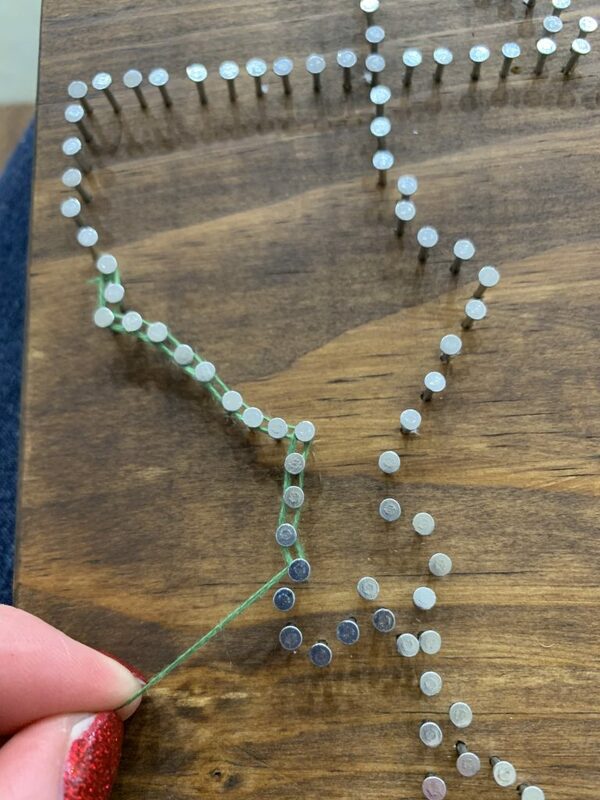 Note: I noticed that if I used a pushpin to poke little holes along an entire area it made hammering the nails in much easier. 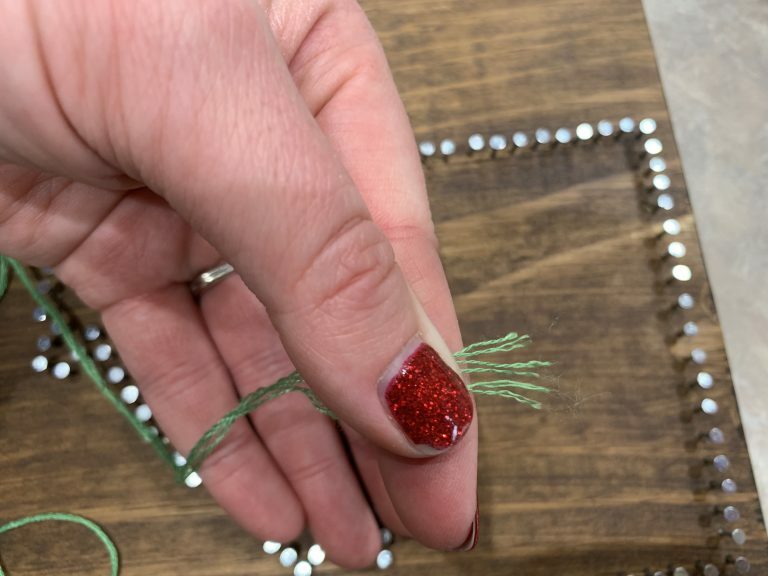 When hammering the nails make sure to leave the nail poking up about 1/4″. Yay! 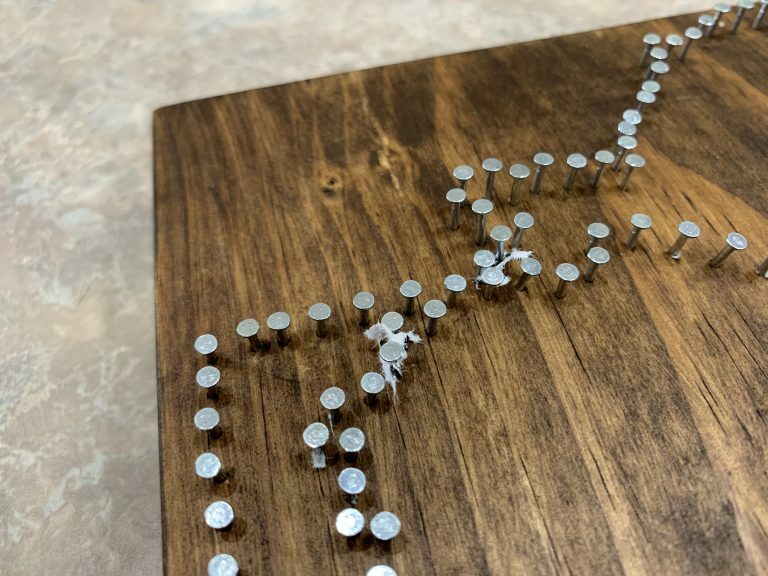 The nails are all hammered into place. Now rip off the template. 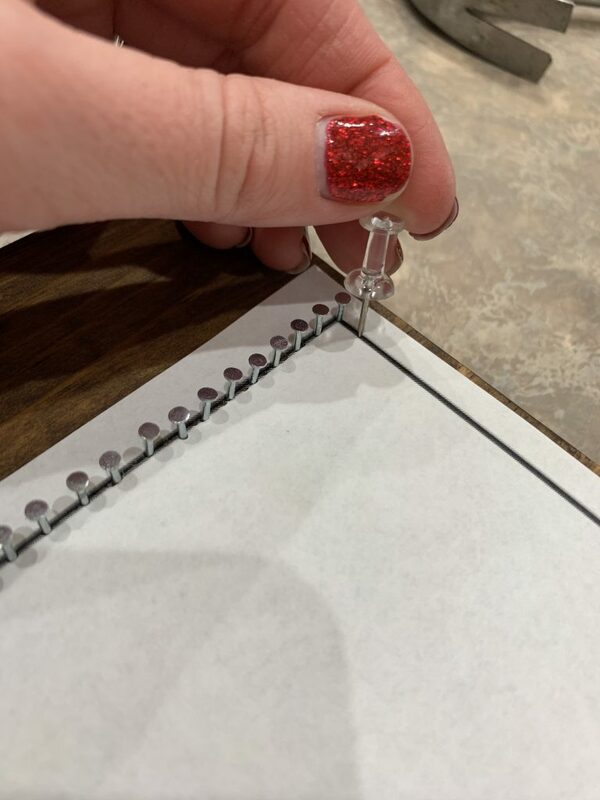 As you begin removing the template you will notice a few little tiny pieces get stuck on the nails and are hard to reach to pull off. No worries! 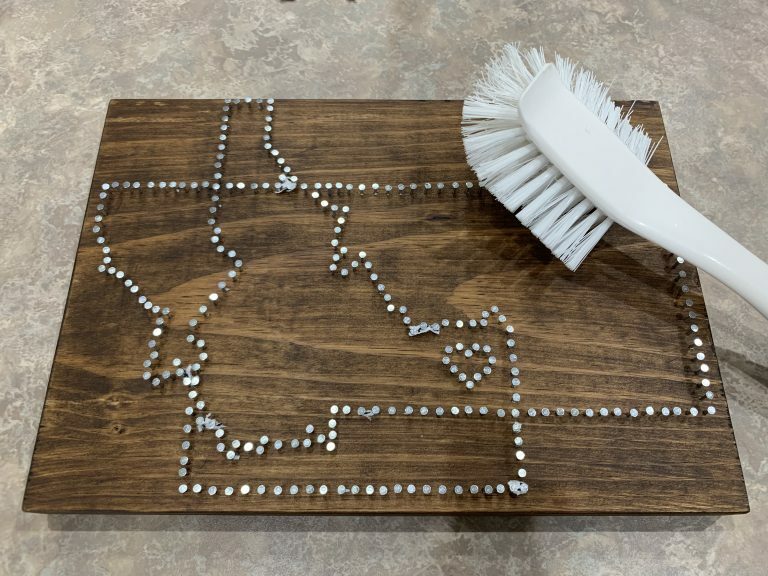 Just grab a dish brush and scrub it’s bristles over all the nails and those little pieces will just come right off. 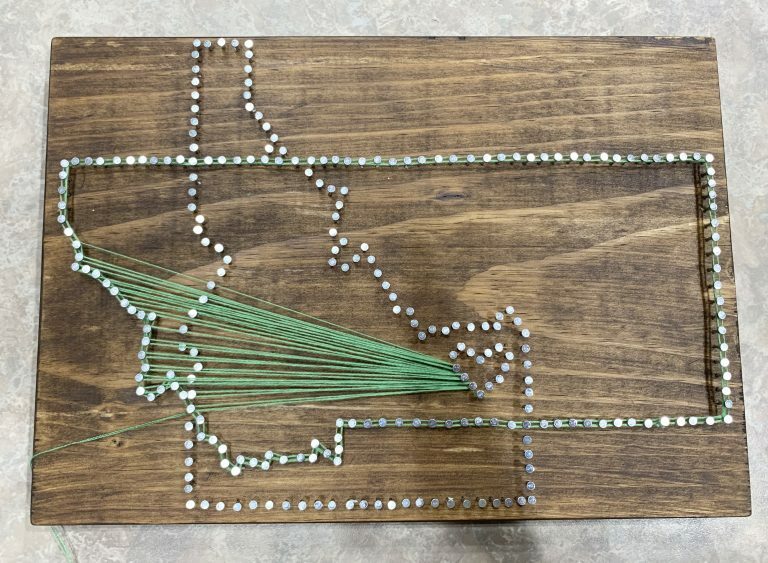 So for my design, I chose to do the green colored string state first. Note: I only used 3/6 of the Embroidery floss stands for this entire project. 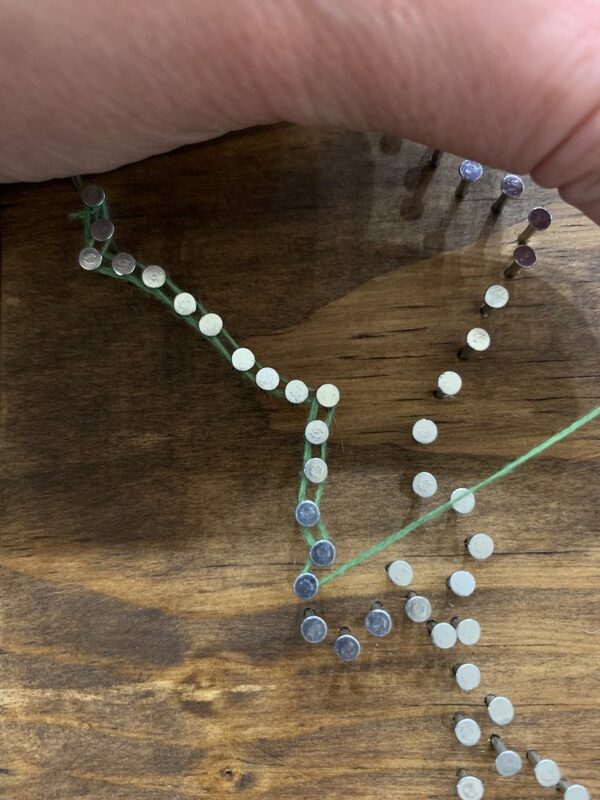 Begin by tying your string onto one of the nails with a knot. 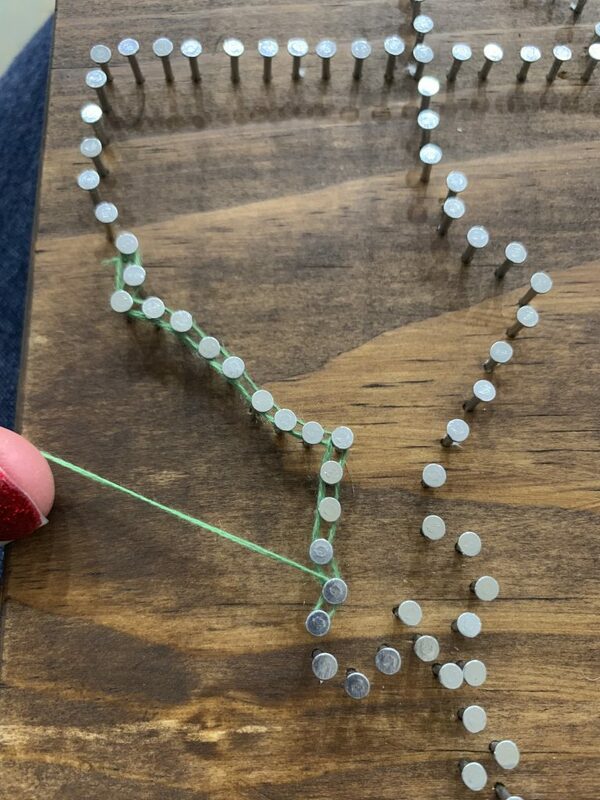 Then “loop” the string around two nails. 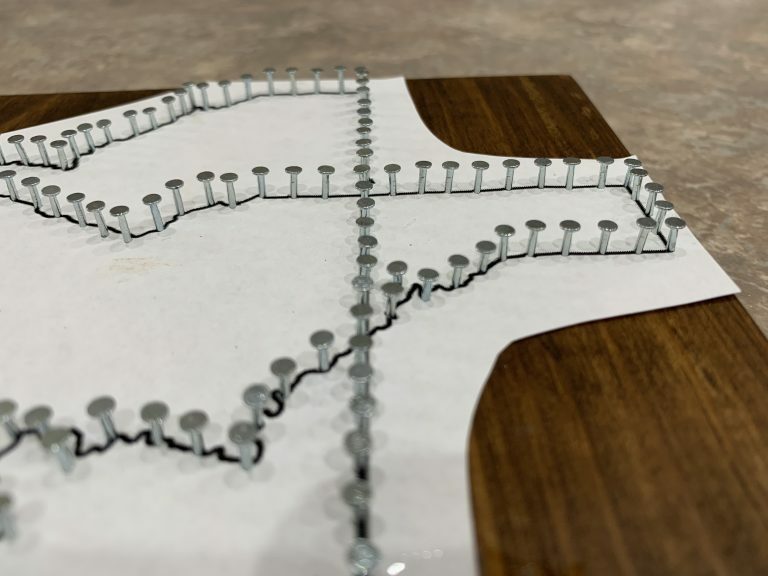 Now take the string and go down the next two nails and continue on this methods around the entire state. 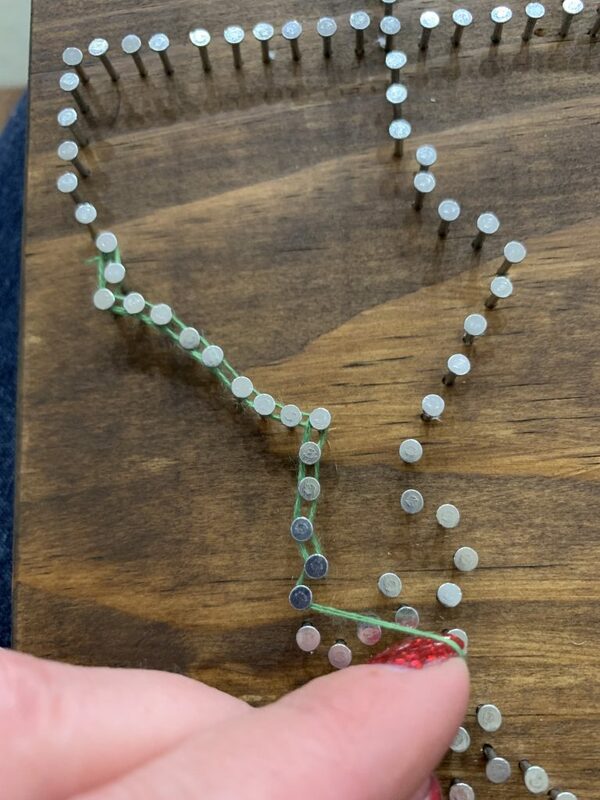 Once fully outlined, take the string and loop it onto one of the nails of the heart and then bring it back out to the perimeter of the state now back to the heart and continue until all of the perimeter nails have been “connected” to the heart nails. Now do the second state. 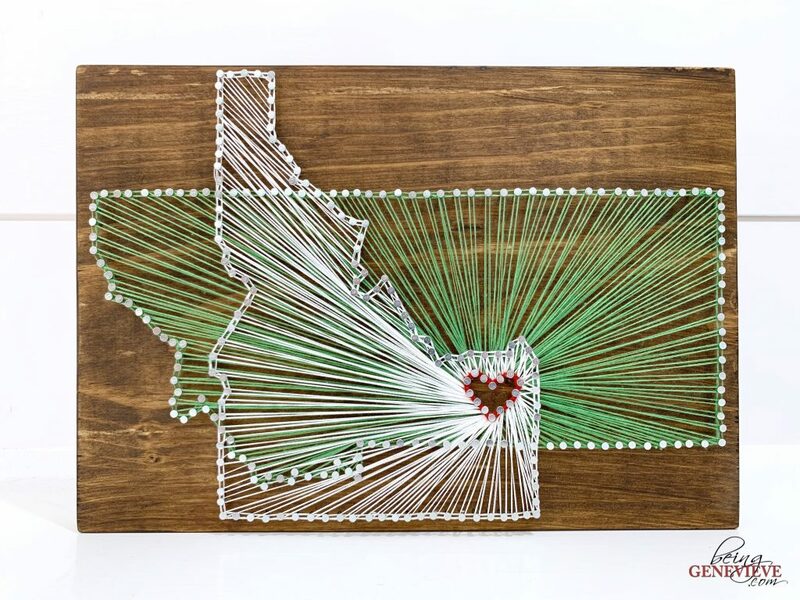 After both states were strung I then outlined the heart in red, but that is totally optional.